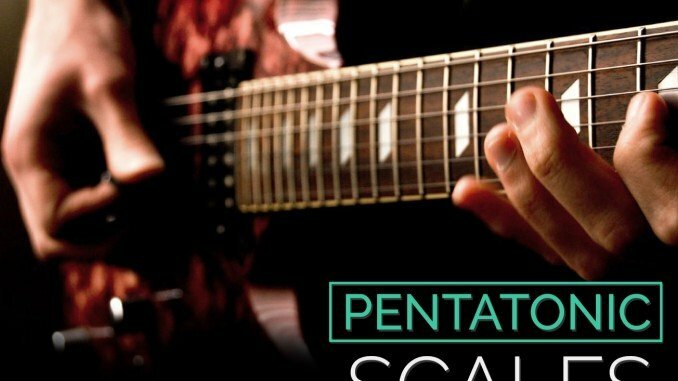 Pentatonic scales contain five notes, which is how it gets its name (Penta=5, tonic = tones). There is a major pentatonic scale and a minor pentatonic scale. The awesome part is that they contain the same note intervals (with differing roots), so the patterns are the same. You just need to learn a new root note. 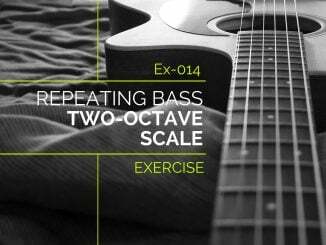 There are a few reasons that the penatonic scales are the short cut for the scales. You can learn the same exact patterns for both. You just need to know how the root note changes in the pattern. You can play the major pentatonic scale over almost any major or dominant chord without clashing with the chord. You can play the minor pentatonic scale over almost any minor chord without clashing with the chord. Sometimes you can play both scales over the same chord, especially for a bluesy sound. Isn’t that an exciting and simple formula for success? This is why pentatonic scales are so popular. 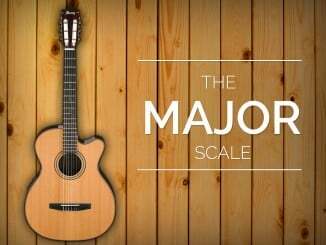 Did you know the blues scale is based off the minor pentatonic scale. It just adds one note. Learn more in my blues scale lesson. Play the major pentatonic scale over major chords. For example, over C Major you could play the C Major pentatonic scale. Some people claim that you can play the C minor pentatonic scale for a bluesy sound. Yes, you can, but you should be mindful of the notes you are playing. The minor pentatonic scale has a minor 3rd (or b3) while the major chord as a major third. This note can clash, but you can bend the minor third up a half step to a major third, which is a common tactic by blues guitarists. Use the minor pentatonic scale over minor chords. For example, play A minor pentatonic over an A minor chord. You can use both major and minor pentatonic scales, but once again, be cautious of the minor third when playing the minor pentatonic scale. For example, you can play C Major pentatonic or C minor pentatonic over a C7 chord. Dominant chords have a major third and a minor seventh (b7). The minor pentatonic scale has a minor third, which may clash with the chord’s minor third. Once again, bending the minor third up to the major third is a nice bluesy sound. In this case, the minor pentatonic scale contains the minor seventh, so that note sounds great. The Major pentatonic scale does not have any clashing notes. If you are a fan of Jimi Hendrix, you know that he likes to play a Dominant7#9 chord. The 9 is also called the 2nd. The #9 is enharmonically the same as a minor third (b3). In other words, if you see this chord, it implies that you should play the minor pentatonic scale since it has a minor third. I am cautiously going to make a recommendation here. Since the chords change, you can follow my rules below and be safe. All the notes should sound fine. Just remember that some notes will sound better than others depending on current chord. In a major key, play the major pentatonic scale and its relative minor interchangably. In the key of C, you would play the C Major pentatonic scale or the A minor pentatonic scale. In a minor key, play the minor pentatonic scale. I just told you that you can use the same patterns, but the difference is where they start. For example, if you use the C Major Pentatonic Scale, the matching minor pentatonic scale is the A minor pentatonic scale. It is 3 frets or semitones down from C. If you know your relative minor scales, A is the relative minor of C. Let’s take a look at two box patterns. Take a look at these two popular pentatonic box patterns. You’ll note that they’re the same except the root note location is 3 frets down for the minor pentatonic scale. If you’re familiar with the CAGED chords, you’ll notice that this box pattern relates to the G form and the E form respectively. I will show you the box patterns for all the CAGED forms later. What this means is that you need to know exactly five box patterns for both scales. I will cover patterns in greater depth below. Another way to form the scale is in parallel, using the same root note rather than the relative minor. In my opinion, this is useful for learning the notes of the scale rather than just the pattern. To form the scales in parallel, you can take the major scale and use the formulas in the table below. For example, the C major scale is C-D-E-F-G-A-B. To form the C Major pentatonic scale, you would take the 1 = C, 2 = D, 3 = E, 5 = G, 6 = A. To form the C minor pentatonic scale, you would take the 1 = C, b3 = Eb, 4 = F, 5 = G, b7 = Bb. You will notice that the notes are not the same because only the relative minor pentatonic scale has the same notes. In this case, it is A minor pentatonic which is A, C, D, E, G (the same notes as C Major Pentatonic). These are the five CAGED box patterns for the Major Pentatonic Scale. Can you pick out the major chords associated with the forms? You’ll notice that all the chord tones are there! These are the five CAGED box patterns for the minor pentatonic scale. Notice that the root note location changes. Because the root note changes, you’ll also notice that the “chord form” changes too. The E minor box form is the same as the G Major box form. Some people avoid teaching CAGED for these boxes to avoid confusion. I think it’s best to associate the chord form, which you should know, to the proper box patterns. Another method of learning the pentatonic box patterns is to use single octave patterns. 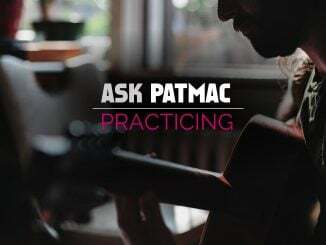 If you know how to move single-octave box patterns around the fretboard, you can use these two patterns to simplify the learning process. The single-octave patterns can be linked to produce two diagonal patterns, each repeated three times. The figure below shows two diagonal major pentatonic patterns. The two combine to provide a pattern with a root on each string. Similarly, the single-octave minor pentatonic pattern can be repeated to form two diagonal scales with roots on every string! Can you identify where these diagonal patterns fit the box patterns? As an exercise, I recommend finding where the box patterns fit into these diagonal scales. Once you know the pentatonic scales, you are ready to play the blues. I highly recommend that you check out my 12 bar blues lesson to start improvising. You can also incorporate some blues licks. You can find some licks in my Licks, Riffs, and Tricks section. If you liked this lesson, please let me know how I can improve it. If you want to learn more about chords, scales, and theory, check Guitar Lesson World The Book. What do the filled-in and not-filled-in notes represent on the box patterns? Blair, Thank you for your comment and question. Filled-in notes are root notes. Not-filled-in notes are the other notes of the scale. In a C major pentatonic scale, the C notes would be filled in. You can move the pattern around too. For example, if you went down in pitch by 1 fret, you would have the B major pentatonic scale. I hope this helps! If you need more information, you can find it in my lesson on chord diagrams, fretboard patterns, and rhythm charts. The first note of the e form box pattern (in the diagram) is being played on the first fret on the e string, but this is an f(e#). Also seventh note on the g form box is also being played on the first fret of the g string and is therefore a g#. Are these box form diagrams therefore correct? Thank you for your question. The box patterns are moveable patterns and not showing a specific fretboard location, though I can see why you were confused. You must place the root note on the proper note rather than assuming the fret number of the box pattern. The root note can be on an open string. In the case of the E minor pentatonic box, the first fret of the pattern should be the open strings (or the 12th fret if you want to play an octave up). Similarly, the G major box pattern, should be rooted on the open 3rd string or 12th fret of the 3rd string. I hope this helps! I just was trying the same lesson and had the same questions. Thanks for you clear, helpful explanation. Now I’m getting it! What do the black dots represent? Thank you for the question. The black dots are the root notes of the pattern. Are rhe root notes played first and the note right before the next root note is that the completed scale or does the scale end on next root note. If played sequentially, a scale technically does not include a root note at the end. In practice, many people include it. In my opinion, it is important that you know the sequence and how to find notes relative to the root note, such as which note is the 5th note of the scale. When practicing, I like to repeat the root note at the end because you can start a new scale from that note. It also provides a nice feeling of resolution.